The Business Management Studies (BMS) program provides an academic path for international and permanent resident students whose first language is not English (and do not meet the general English requirements) to enter a full-time diploma program in the School of Business at BCIT. For some students who want to study a shorter program in business, the BMS program also provides an excellent opportunity to learn basic Canadian business skills and improve their English competency. 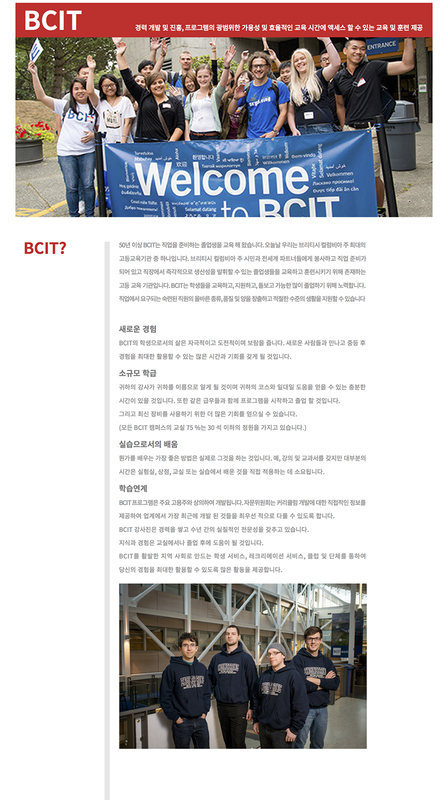 International and ESL students sometimes find the challenges of a transition to Canada and instruction in English and the intense BCIT programming too much to meet. By studying in the BMS program, students can work up to the high level of work and English competency that is needed to succeed in the diploma programs. The Business Management Studies program has several pre-entry levels of English language instruction available that help bridge you to the level of English you need to succeed at BCIT. Class sizes are kept small to ensure there is more attention to your individual needs. At the end of the program, you will be eligible to receive an Associate Certificate and apply for entry into Level 2 of most business diploma programs at BCIT. Do you want to live and work in Canada? BCIT’s International Student Entry Program (ISEP) can help you reach your professional and educational goals. ISEP develops overall English language and academic skills. It is also a direct pathway to BCIT certificate, diploma, and degree programs. Students can choose ISEP to improve their English and academic skills or ISEP Plus Follow-up Program if they want to continue studies in a BCIT program. Students who complete ISEP level 400, 500 or 600 are eligible to transfer into a BCIT program. ISEP provides training in reading, writing, speaking, and listening skills at all levels of English Proficiency. ISEP focuses on improving ESL students’ language by integrating English skills with business and technical contexts. ISEP also supports academic success by helping with cultural adjustment, studying specific topics, and developing critical skills. ISEP helps international students succeed in BCIT programs. Attending 25 hours of English classes per week provides ESL students with more English development than TOEFL or IELTS alone. ISEP also develops confidence in English language skills while teaching learners how to succeed in North American post-secondary programs. ISEP Plus Follow-up Program applicants have formally declared their intent to continue their studies in a BCIT diploma (or other credential) upon successful completion of the required English level in BCIT's International Student Entry Program (ISEP). * Some programs have a competitive entry model where the department chooses the best qualified applicants. When a competitive entry program lists minimum and preferred grades, it is strongly recommended that applicants meet the preferred grades in order to be considered competitive. Please refer to the BCIT website to find out if this is applicable for your program. The Technology Entry (TE) program is for individuals who want solid academic preparation before entering a BCIT Technology program. It is appropriate for individuals who need to improve their skills in core areas such as communication, mathematics, chemistry, and physics in order to meet program prerequisites. It is also suitable for those who need B.C. educational equivalents to supplement credentials earned in other school systems. The TE program is a 15-week, full-time day school program that offers a broad introduction to post-secondary education in a focused but welcoming atmosphere. An introductory course in computer applications, a learning skills seminar and an overview of technology options and related careers round out the traditional academic subjects. Some programs have prerequisite requirements not offered by the TE program, such as biology courses. Please check the BCIT website for individual program prerequisites and entrance requirements.